You basically grab an old pot (plastic, preferably) that’s about the shape and size you want your new pot to be and you use it as a form to sculpt a new pot from. 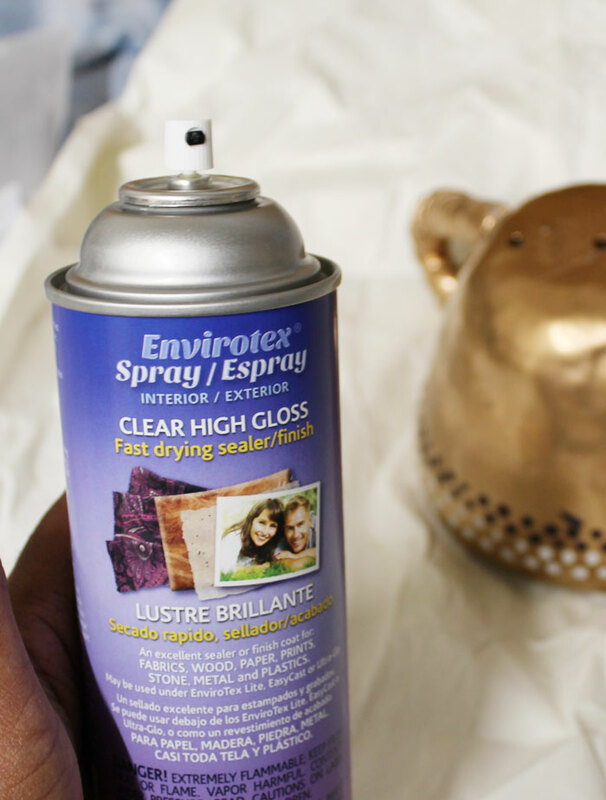 Make one or more to place anywhere around your home. This would also be fun as an oversized planter for outdoors! 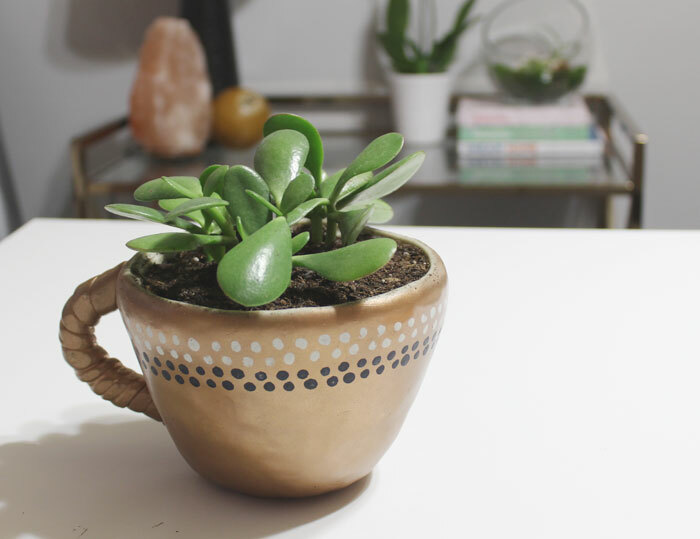 Since I’m a coffee fiend and used to use all my old, cracked mugs for planting tiny succulents, I decided to make my own coffee mug inspired planter to hold larger plants. 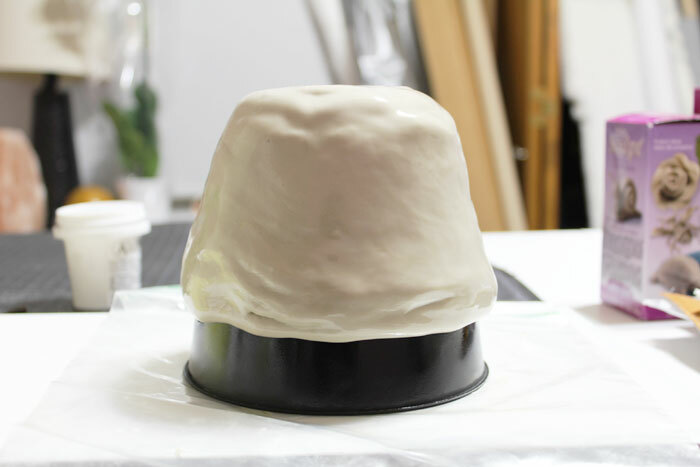 To create the shape of your new pot, you need to mix a batch of the Easy Sculpt Self-Hardening Modeling Clay and use your plastic pot as a template for the new pot. 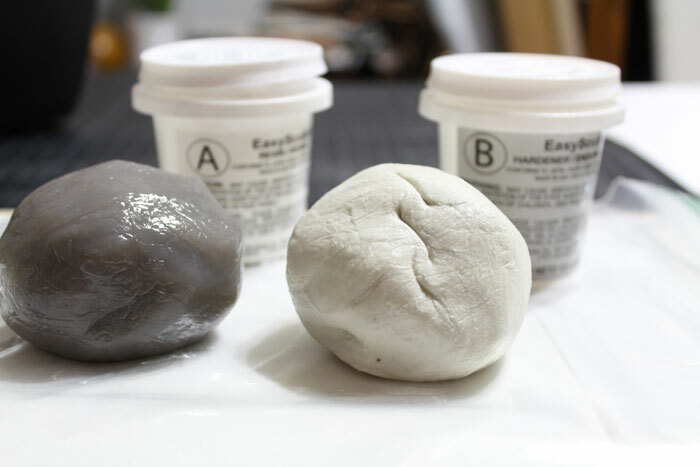 First, you need to mix equal parts of part A & part B of the Easy Sculpt. Eyeball two equal sized balls of each mixture and mix thoroughly, until the mixture is a solid color. Let your mixture sit for a few minutes and KEEP CHECKING ON IT. 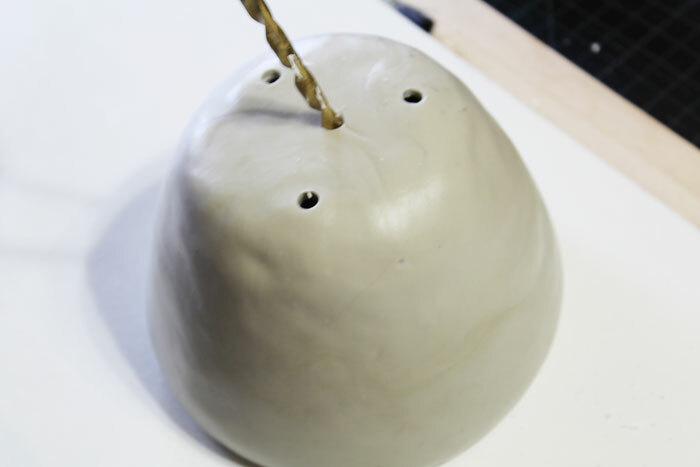 You only want your mixture to harden slightly to make it easier to sculpt the new pot. Then, once your mixture has hardened slightly, but is still pliable, turn your plastic pot upside down and form your new pot by spreading the Easy Sculpt mixture around the sides and bottom of the plastic pot. I used the lip of the plastic pot as a guide for how deep I wanted my new pot to be, but depending on the look you’re going for, you can spread your Easy Sculpt mixture along the entire bottom and sides of the plastic pot. 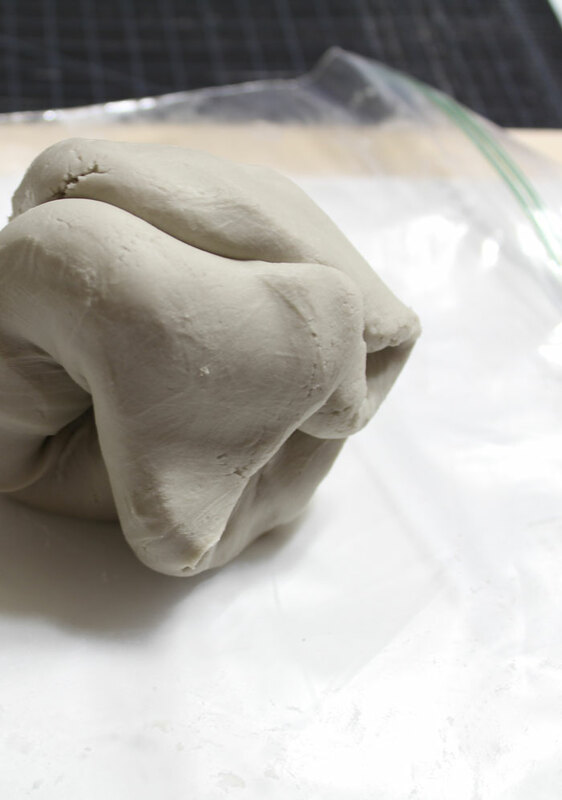 You’ll need to keep checking on your mixture every couple of minutes or so, because depending on how pliable your Easy Sculpt mixture is, gravity will cause your mixture to slide down the length of the plastic pot. 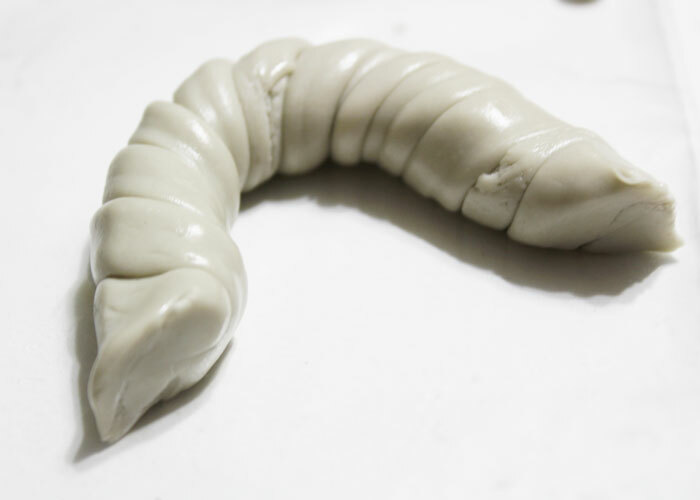 You’re going to have to keep shaping and pushing the Easy Sculpt mixture in place until it hardens enough not to move. I did this for about 17 minutes while I watched videos on YouTube. Mix another (much smaller) batch of the Easy Sculpt just as you did in step 1 above and shape into the shape of a handle. 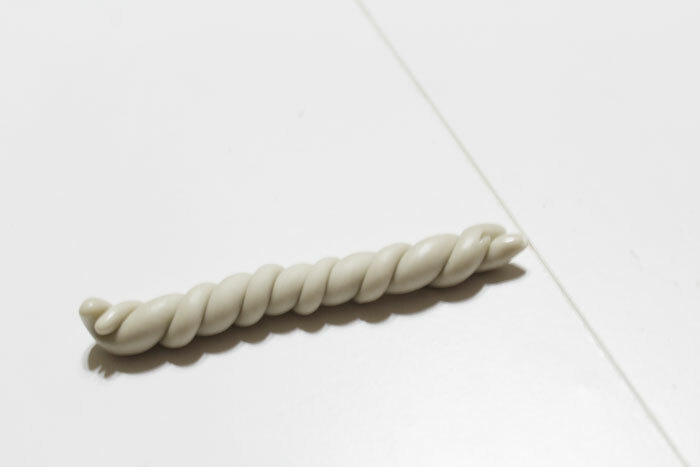 I actually split the mixture into two and created a rope like design in the handle by twisting the two pieces together. 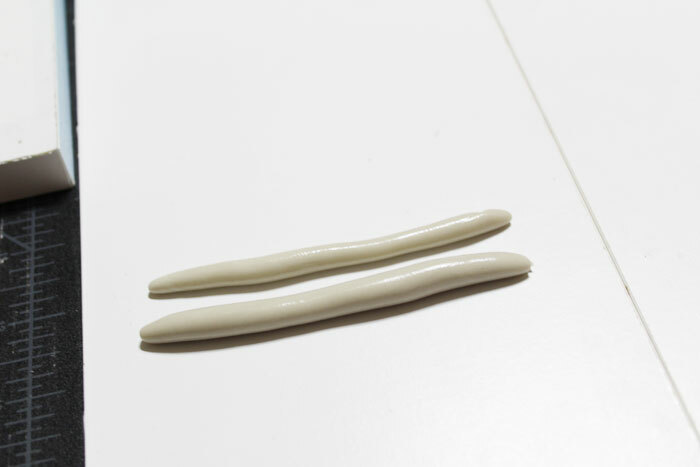 You’ll need to keep checking on and reshaping the handle as it starts to harden, because it’ll start to flatten out while it’s still pliable. 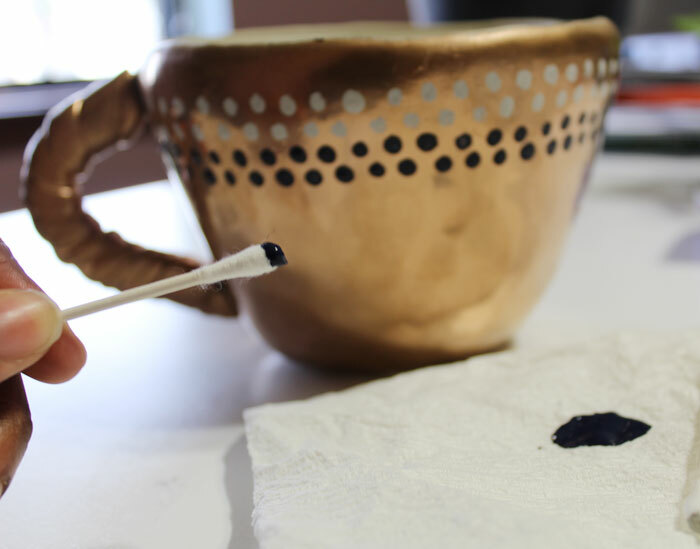 Once your new pot shape (and handle) has fully cured, remove the plastic pot and drill holes at the bottom. 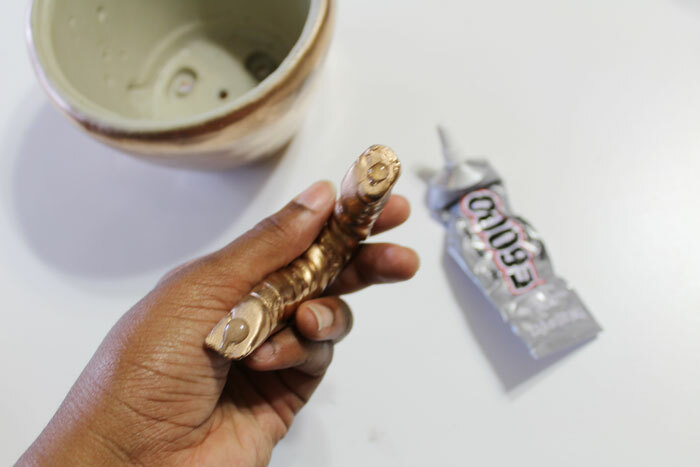 Glue your handle onto the new pot with e6000. 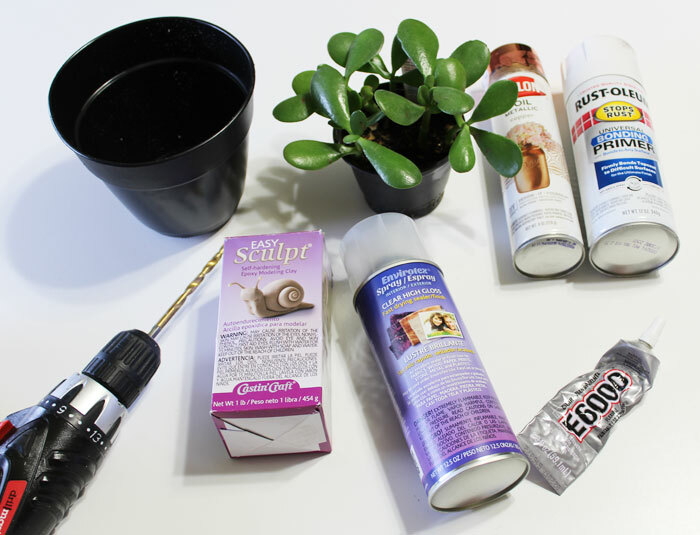 Let the glue dry completely before adding your plant(s) into the new pot. What I love most about this project is how customizable it is. 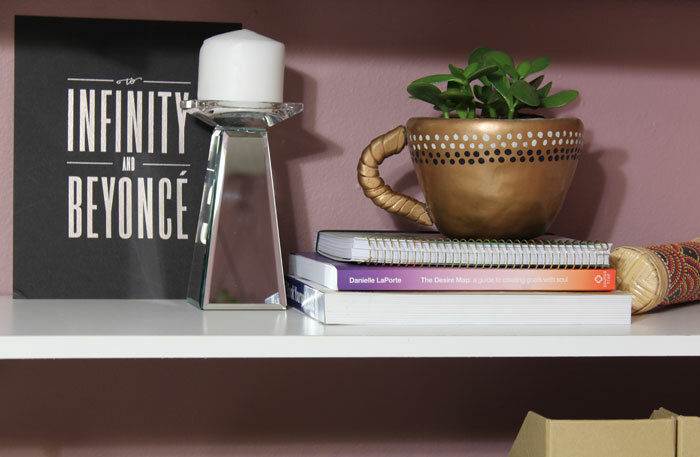 Since my new pot is going in my office, I wanted it to have a copper finish to blend well with my colorful office. 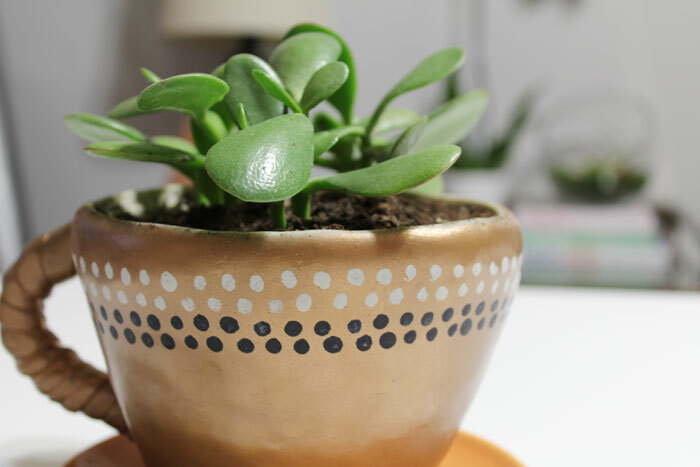 So, I just spray painted it copper and used a Q-Tip to paint gray and navy dots at the upper part of the mug planter for a bit of interest. I primed it before adding the copper spray paint, but that part is optional. I used the Envirotex Spray Clear Sealer to seal the finish. 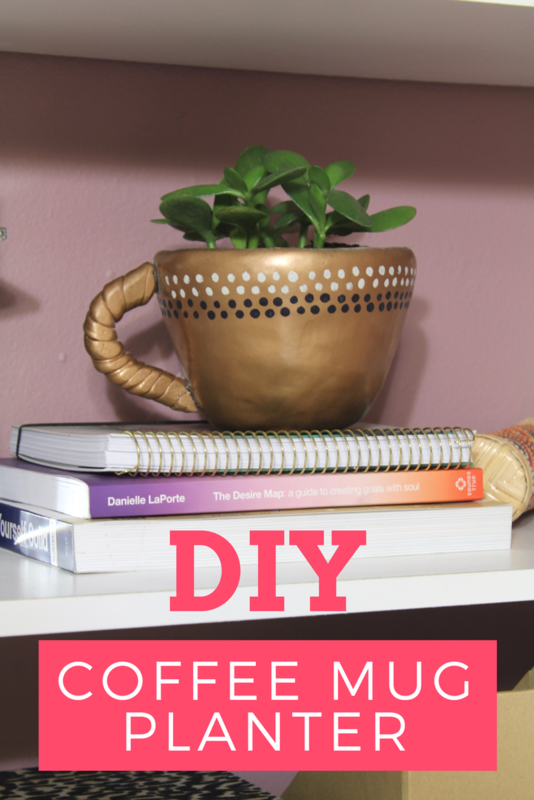 Then, you’ll just add your plant(s) and put your new coffee mug planter in place. I LOVE it in my office, but it would also look great on a windowsill or outside on a patio! How do you keep the dirt and water from draining out the bottom? Hey Lynnann! Once you pack the soil in the pot, it won’t fall out of the bottom. You definitely want the water to drain out the bottom, though. Otherwise, plants will get root rot.